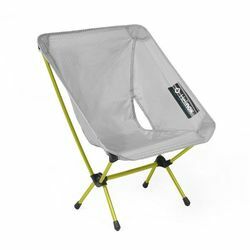 Backpacker Magazine Editors’ Choice Award 2017: Helinox Chair Zero - "Stay high and dry with a chair that’s so light you’ll never want to leave it behind." Helinox Chair Zero. CHAIR ZERO will never make you choose between comfort and weight. Smaller and lighter than a water bottle, it's what your body craves at the end of a long day of trekking.